Average rents in Denver fell for the second quarter in a row, dropping to $1,396 at the end of 2017 down from $1,420 three months prior. “After including average concessions valued at $65, the average effective rent for an apartment in Denver fell to $1,331 per month at the end of 2017,” said Mark Williams, Executive Vice President of the Apartment Association of Metro Denver. Record-breaking new construction once again played a pivotal role in the drop in rents. Apartment completions soared to 13,348 for 2017, eclipsing 2016’s record-setting deliveries of 9,692 new apartments by 38%. “With over 13,000 units delivered in 2017- supply is catching up with demand,” Williams explained, “There are another 131 different apartment communities under construction right now, so we’re expecting at least 10-12,000 units to be delivered in 2018.” The 131 communities will offer over 31,000 new apartment homes all across the metro area. Vacancy increased in each of the last three quarters, reaching 6.4% at the end of 2017, up from 5.4% in the third quarter and 5.0% in the quarter before that. Significantly, Denver’s average vacancy also increased on a year-over-year basis, suggesting that the increase isn’t a purely seasonal phenomenon. Average vacancy stood at 6.2% at the end of 2016 compared to 6.4% at the end of 2017. After many years of upward pressure on rents due to low vacancy, the trend in Denver apartments seems to be easing in renter’s favor. “Denver has virtually gone seven straight years with vacancy rates below 6%. That put upward pressure on rents,” explained Williams. “Now vacancies are creeping up in several areas, which is creating new opportunities for renters, especially downtown.” Moreover, according to the report, there are an estimated 21,541 vacant units in the Denver-metro area which is more than at any time since 2009 during the great recession. The report covers 44 submarkets and found a wide range of rents based on location and building age. The influx of new residents continues to be a wildcard for experts trying to forecast future trends in housing costs. As construction industry races to keep pace with new demand, other efforts are underway to meet Denver’s affordable housing needs. The Apartment Association of Metro Denver has partnered with Denver’s new Lower Income Voucher Equity Program (LIVE Denver) to create immediate affordable housing options. “Through a partnership with employers, foundations, apartment communities with vacant units, and residents, we work to bridge the funding gap many families currently experience in their housing,” said Nancy Burke, Vice President of Community & Government Relations for the Apartment Association. 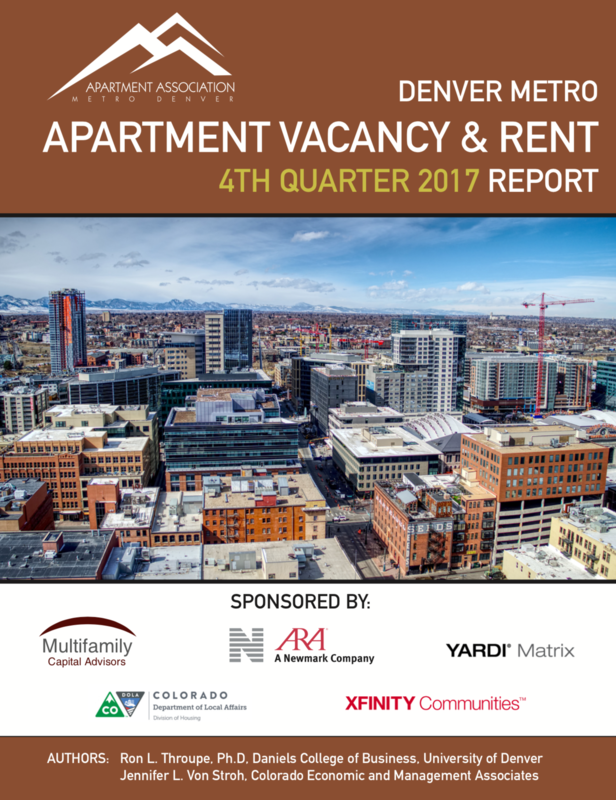 The Denver Metro Area Apartment Vacancy and Rent Report is coordinated and published by the Apartment Association of Metro Denver. The survey is conducted by the University of Denver’s Daniels College of Business and Colorado Economic and Management Associates, and sponsored by The Colorado Department of Housing. The Apartment Association of Metro Denver is the sixth largest multi-family housing trade associations in the country, representing and supporting over 335,000 apartment homes in Denver. The quarterly Vacancy and Rental Rate Survey is authored by Ron L. Throupe, Ph.D. of the University of Denver Daniels College of Business, and Jennifer L. Von Stroh of Colorado Economic and Management Associates. It has served as a reliable source for comprehensive data and analysis for over 36 years and is made possible through the ongoing participation of the apartment industry and broad support from private and public sector sponsors.